Greetings and salutations all. Well, here we are at another installment of Captain's Log. 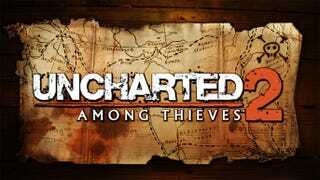 This installment will chronicle my play through of Uncharted 2, as the colon filled header suggests, and maybe a few bits on Pokemon Y. Who's to say? Well, me, but I guess it all depends on if I want to make Pokemon its own installment. Whatever, let's hop to the Uncharted talk! So things start off very well in this game. It’s been a while since I played the first Uncharted, so it was nice to get a refresher right away. Plus, it wasn’t a blatant tutorial so I really liked that. After that things sunk into my old Uncharted habits. Pretty ok at the shooting bits, loving exploring the world, and kinda hating that the combat requires me to hide every few minutes just so I can get back to full health. I would easily say that’s my biggest gripe with the gameplay in the series as a whole. I appreciate that they don’t want to have a health bar that I can’t refill so I can get back to the action more, but it just bugs me. Why not just make me invulnerable or something? There were times when I couldn’t find out the optimal way to take guys out, and I had to replay the same minute or so several times just to figure out the proper order in which to take out the enemies. Plus the stealth kills often decide to not work, so I would generally just stand up and punch the air when I wanted to kill a guy discreetly. Yeah, I just wish the combat was a little more free form, or the health system was different somehow. I’m sure I would complain just as much if Drake was invulnerable, so I’m not sure what I would want changed. Beyond my gripes with the combat, I loved the game. I found it a bit jarring that Drake was so unwilling to believe in the supernatural aspects of the plot, given that he lived through the events of the first game but other than that it was fine. The twist of the Cintimani Stone being resin from the Tree of Life was very unexpected, and I like that it tied in to the importance of the resin to finding the way to Shambala. I can’t quite say that Uncharted 2 is a modern day classic like most do. I just have far too many little issues with it to truly put it into my upper tier of last gen (weird to think of it like that) games, but it’s really close. There were a few things that I would have liked to see changed; the combat first among them, but possibly a more interesting art direction would have pushed it over the top, but overall I truly enjoyed the experience. It’s probably the best game I’ve played for my PS3 in the yearish that I’ve had the console, so it’s got that going for it. So that’s it. Quick and dirty, but that’s what Captain’s Logs are all about.